The Record-setting Craps Run in Atlantic City - What Happened? The Record-setting Craps Run in Atlantic City – What Happened? One such event occurred recently here on Earth. 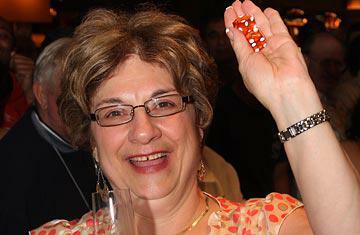 What: Patricia set a craps world record for 154 consecutive rolls of the dice in a single turn at the Borgata Hotel and Casino. Where: None other than Atlantic City. As it turns out, that is not such an easy question to answer, as the rules of craps dictate that determining the odds of such an event involve multiple different considerations. In craps, it takes a seven to end a shooter’s turn; however, the turn can’t end during a come-out roll, and the number of come-out rolls out of 154 could be anything from 1 to 154. In other words, it’s super complicated. Michael Shackleford, an adjunct professor at the University of Nevada, Las Vegas, weighed in on the issue. He estimated the probability by running 21 billion simulations. He found that only six times shooters rolled 154 times or more. That makes it a one-in-3.5 billion shot, an estimate reported by the Newark Star-Ledger. “We’re talking about an once-in-a-lifetime event,” said Frank Scoblete, co-founder of the Web site Golden Touch Craps. Scoblete is a self-professed craps wizard, himself holding a record of 84 straight throws of a specific number based on tips that he provides on his website on how to roll for a specific number. Unlike Scoblete, DeMauro told the press that she was a craps “novice.” When asked to take a look to see if DeMauro was employing any sort of advanced craps techniques, Scoblete concurred that the lucky woman in question wasn’t using any sort of special throwing techniques. “This was strictly luck,” Scoblete said. There you have it, craps enthusiasts, something that you are likely never to witness again—or will you? If you think that you have what it takes to step up to the table and break the 160 mark, we would love for it to happen here at Silver Oak. Try out free online craps today!